Connect Four is a game that not only connects us to our childhood but brings a sense of play into math practice. Within the Connect Four Bundle students will be able to practice various skills for fact fluency, computation, problem solving, strategy and more. 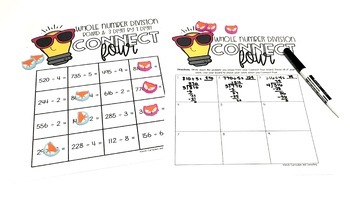 Through the use of Connect Four games you can easily set up a station during Math Workshop that swaps out the concept each week and not have to reteach the directions throughout the year allowing you to WORK SMARTER, NOT HARDER! Connect Four is also great for review of skills, early finisher activities, enrichment, a worksheet alternative, partner activity, or as a take-home activity to encourage families to work together. Interested in looking for other ways to play Connect Four in your classroom? Check out these other ways that you can implement this into your classroom with some FREE downloads for How to Play! Each of the Connect Four Games are aligned to Common Core (CCSS), Texas Essential Knowledge and Skills (TEKS) and Oklahoma Academic Standards (OAS) and meant to be able to be used in any classroom. 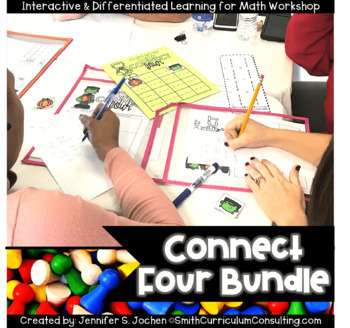 Looking for Other Math Workshop Resources? → Did you know that you can get CREDITS for future purchase by leaving feedback on each of your purchases? Simply navigate to the My Purchases page and next to each download you will be able to leave a star rating and comments about the activities you have purchased. I truly value your feedback and consider each and every word left.